Body language says a lot about a world leader's audience with the Pope. During his 2007 visit to Pope Benedict XVI's private library, President George W. Bush sat down across the desk from the Pontiff as if he had just landed on his own porch in Crawford, Texas: leaning back in the velvet chair, legs crossed, apparently eager to show his command of the situation. When President Barack Obama sat down in that same spot on Friday, July 10, for his first papal meeting, his posture was altogether different. Leaning forward from the front edge of the chair, his shoulders slightly hunched, his crossed hands resting softly on the edge of the Pope's desk, the leader of the free world looked more like a schoolboy who'd arrived to humbly plead his case to the principal. "You must be used to getting your picture taken," Obama commented to the Pope as a scrum of photographers clicked away, then continued, "I'm still getting used to it." 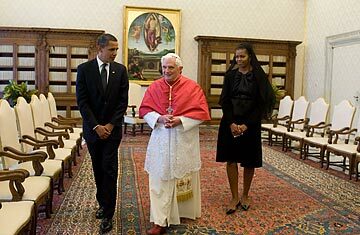 The potential for global symbolism abounds whenever an American President meets the Roman Pontiff, and the first-ever encounter between the 47-year-old Obama and the 82-year-old Benedict offered a vivid snapshot of how the change of the guard in Washington looks on the world stage. Of course the differences are not just in the humble body language but in hard policy. To a large degree, the deck has flipped from the Bush era: the Obama Administration's focus on dialogue-centric, multilateral foreign policy is to the Vatican's liking, while its support of abortion rights and stem-cell research are a deep worry after the Pope's having had an ally on bioethics in the White House for eight years. And during the oddly scheduled Friday afternoon meeting, crammed between the end of the Group of 8 meeting in L'Aquila, Italy, and Obama's departure for Ghana, the Pope had no intention of papering over differences on what the Vatican calls "life" issues, such as abortion and euthanasia. While reporters and photographers waited in a narrow Vatican corridor outside the library during the private audience, the Pope's personal secretary, Monsignor Georg Ganswein, disclosed that there was one item added to the list of gifts for Obama: "Dignitas Personae" ("The Dignity of a Person"), a Vatican document released in December that lays out its latest stance on biomedical ethics. "It can help the President better understand the position of the Catholic Church," said Ganswein. When the Pope presented him with the light green softcover document after their 35-minute closed-door meeting, Obama quickly responded, "Yes, this is what we had talked about." And like that humble schoolboy, the President assured the Pope he would read it on the flight to Ghana. Patrick Whelan, head of the Catholic Democrats organization in Boston, believes that the Pope's particular emphasis on bioethics may have been due to the recent uproar in the U.S. Catholic Church over the President's invitation to give the commencement address at the University of Notre Dame. Some Catholic bishops opposed to the invitation because of Obama's stance on abortion and other ethical issues had hoped in vain that the Vatican would join the fray. "There was a feeling that [the Pope] didn't back them up over Notre Dame," said Whelan. "He wanted to show them that he wouldn't shy away from these issues in front of Obama." Vatican spokesman Father Federico Lombardi told reporters after the audience that it was important for the Pope to be clear about the Church's stance on ethical issues. "It would be ambiguous to hide or minimize what we believe," he said. "It's not meant to be divisive or polemical." Lombardi added that the Pope told him that Obama "explicitly expressed his commitment to reducing the numbers of abortions and to listen to the Church's concerns on moral issues." Father Lombardi said the Pope seemed "extremely satisfied" with the meeting and was "well impressed" with Obama, who was "attentive and ready to listen." White House officials said the President hand-delivered a letter to the Pope from Senator Edward Kennedy, who's suffering from an incurable brain tumor, and Obama asked for prayers for the brother of the only Catholic President in American history. Benedict, who doesn't have the same instincts in world diplomacy as Pope John Paul II and has had some notable verbal missteps, has a new opportunity with a like-minded Obama Administration to have more of a say on a vast array of foreign policy challenges. Among other issues touched upon was the West's relations with Islam, and the White House noted that they spoke about Obama's recent speech in Cairo directed at the Muslim world. Still, beyond the private talk, Obama's visit to the Vatican  in which the President's wife and daughters also got a private tour of St. Peter's Basilica and the Sistine Chapel  is one of the key encounters of his first year in office. It gives him the chance not only to solidify support from U.S. Catholic voters at home but also to spread his new American gospel to the world.